Lucky for me this week, I didn’t have any review books come in the mail. 1. A Small Death in Lisbon by Robert Wilson, which I just started this past week and it’s good so far. 1941. Klaus Felsen, forced out of his Berlin factory into the SS, arrives in a luminous Lisbon, where Nazis and Allies, refugees and entrepreneurs, dance to the strains of opportunism and despair. Felsen’s assignment takes him to the bleak mountains of the north where a devious and brutal battle is being fought for an element vital to Hitler’s bliztkrieg. There he meets the man who plants the first seed of greed and revenge that will grow into a thick vine in the landscape of post-war Portugal. Late 1990s. Investigating the murder of a young girl with a disturbing sexual past, Inspector Ze Coelho overturns the dark soil of history and unearths old bones from Portugal’s fascist past. This small death in Lisbon is horrific compensation for an even older crime, and Coelho’s stubborn pursuit of its truth reveals a tragedy that unites past and present. Robert Wilson’s combination of intelligence, suspense, vivid characters, and mesmerizing storytelling richly deserves the international acclaim his novel has received. 2. What Matters in Jane Austen? Twenty Crucial Puzzles Solved by John Mullen, which I saw reviewed at Anna’s blog, Diary of an Eccentric and wanted to check out. In twenty short chapters, each of which explores a question prompted by Austens novels, Mullan illuminates the themes that matter most in her beloved fiction. Readers will discover when Austen’s characters had their meals and what shops they went to; how vicars got good livings; and how wealth was inherited. 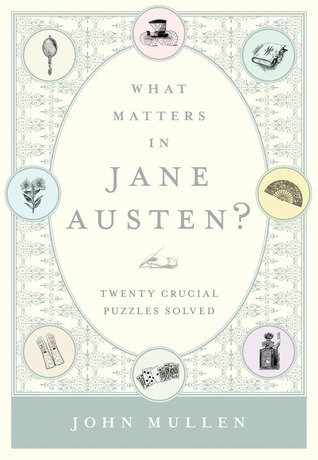 What Matters in Jane Austen? illuminates the rituals and conventions of her fictional world in order to reveal her technical virtuosity and daring as a novelist. It uses telling passages from Austen’s letters and details from her own life to explain episodes in her novels: readers will find out, for example, what novels she read, how much money she had to live on, and what she saw at the theater. 3. His Majesty’s Dragon by Naomi Novik, which is our book club’s July pick. As many of you already know, Google Reader ends today. I’ve started using Netvibes, but I exported by existing feeds from Google Reader that overwhelmed me to the point that I quit using it altogether. But this past week I ended up going through it all and paring it down to the 55 Book Blogs I want to read, the 14 authors’ blogs I want to read, 12 writing advice blogs, and a few other miscellaneous blogs for photography, local events, and more. I’ve since moved it to Feedly because I liked how I could organize the blogs into different categories all at once, etc. It made it much easier. My reading has slowed some with the other activities going on this summer and of course, the work schedule that seems to have heated up. I seem to be barely keeping my head from exploding at work these days. But I’m hoping for a nice long holiday weekend for the 4th where I can get some reading done, and just chill out a bit — maybe even get into D.C. for some photography or just some good time at home and fireworks. How’s your summer reading and activities going?